NEXT DAY DELIVERY - DURABEAM FIBER TECH 2018 MODEL !!!! Inflatable couch/double bed. Garden & DIY. Travel & Luggage. Repair patch. AC air pump for rapid inflation. Sturdy coil-beam construction. Comfortable flocked surface. SAVE 53% SAVE % RRP 69.99 WAS. 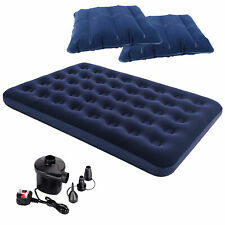 Meradiso air bed 132 x 22 x 191 cm blue double soft velour. Condition is New. Dispatched with Royal Mail 2nd Class. All our Thai cushions and mattresses are filled exclusively with Kapok. Kapok is a fibre produced naturally in the pods of the Kapok tree, Ceiba Pentandra. Thus Kapok is easily superior to many other filling materials concerning comfort and longevity. DURA - BEAM FIBRE TECH TECHNOLOGY - NEXT DAY DELIVERY ! 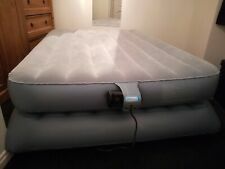 Queen airbed with inbuilt 240V pump – inflates in 300 secs. Simply plug the pump into a UK mains socket and the airbed automatically inflates in 300 seconds, taking the strain out of pumping and making it perfect for putting guests up. • Enjoy a good nights sleep with the Lightspeed Outdoors® Double Airbed. The patented stabiliser system allows the bed to be adjusted from soft to firm depending on your sleep preference. This is due to its high quality TPU (thermoplastic polyuerthane). Plus they are easy to inflate and deflate. And you can rest easy knowing you won't compromise on quality with a Bestway airbed. Bestway's Built-in Pump is a high speed automatic inflation and deflation pump which can inflate and deflate a Bestway airbed in minutes with minimal effort. Worlds Apart - Double Size Adult Readybed Extra Long. 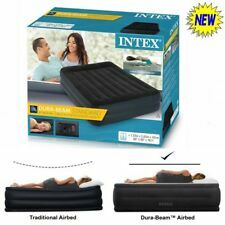 Adult Double Guest ReadyBed airbed and sleeping bag combination - extra long. 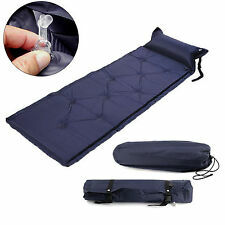 The Adult Double extra long guest ReadyBed is a unique 2 in 1 airbed and sleeping bag. • Internal coil structure provides comfort and support. • Polyester wrap ‘N’ roll carry bag attached. • Airtight® system and Double Lock™ ensure a leak-free valve. • Maximum Load: 295kg. • Type: King. Give your little toddler a good night’s sleep so you can have a good sleep too. To prevent spring feel, the spring is topped with a high-density (HD) insulator pad and a cushion of smart fibre comfort layers. Choice of 8 Colours and a very Special Offer Price! INTEGRATED PILLOW - Ergonomically designed raised-pillow provides head and neck support with bed-like comfort for a great night's sleep. FULL-BODY SUPPORT: This blow up bed is fitted with 35 structured air-coils to provide maximum support for your body, neck and spine. This mattress uses an open coil spring system. An open coil mattress is made from circular springs woven into a single spring unit, covered with strong material to give a comfortable feel. Mattress Type: Coilsprung. 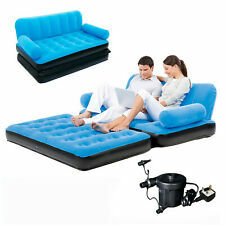 Aerobed double inflatable bed with built in electric pump . Condition is Used. Dispatched with Other Courier (3 to 5 days). The Cornerstone Airbed inflates in 5 minutes with the built-in air pump so it is ready for bed when you are. It features a stability enhancing lower chamber and the comfortable backrest provides a sturdy recline and read experience. Eddie Bauer childrens boy girl pushchair foot muff. Blue Grey, fleece lined.